Since 1998, the Mosby Heritage Area Association has offered an annual three-day conference examining the Civil War in Virginia, Maryland, and Pennsylvania through the lens of leadership as well as historic preservation. 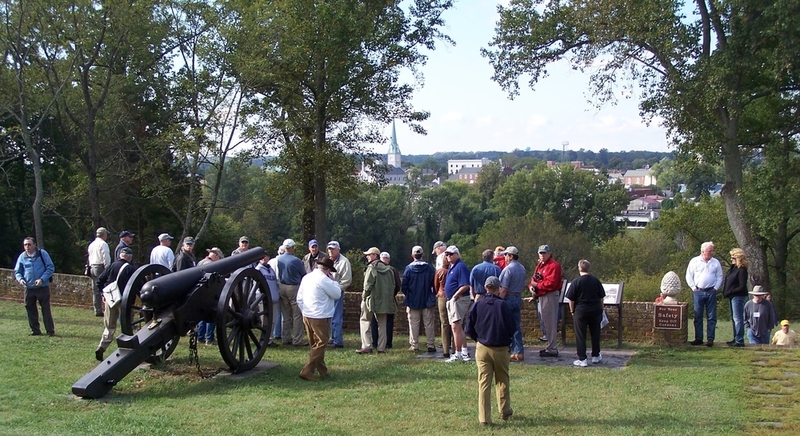 MHAA brings vetted experts with links to both the leaders of the Civil War and the battlefields and landscapes on which their actions played out. Meeting at the classically handsome Middleburg Community Center, right, where President John F. Kennedy once attended church, conference attendees are provided with eight provocative talks on the annual topic beginning the Friday night of the conference and ending with a panel discussion of these historians on Saturday, followed by an evening banquet. Sunday, the final day of the conference, several of the historians will take us by luxury bus into the field to walk the ground and note the preservation efforts involved as we go. Program: Childs Burden, conference director, has superb connections with fine speakers. Co-founder of the Mosby Heritage Area and a longtime board member of the Civil War Trust, he has run the program with great heart since its very beginning. He has his finger on the pulse of conference topic and ensures we get the best experts to speak on it. Opportunities: The conference offers you a superb opportunity to socialize, question, dine, and interact with the conference historians. And with historians ribbing each other unmercifully as they grapple with a serious topic, you can expect a supremely comfortable atmosphere. Location: Middleburg, Virginia, and environs—the heart of the Mosby Heritage Area—is lovely country with superb accommodations, dining, and an ideal location for day trips should you wish to bring a spouse, partner, or friend who may be less interested in the Civil War than you are. We are happy to help you find accommodations to suit your needs. Food & Drink: Conference attendees are plied liberally with good food and libations—something is always available as part of the price you pay to attend the conference. Books and Store: Through the services of Owens & Ramsey, Historical Booksellers of Richmond, Virginia, you'll find a superb collection of new and used Civil War books available for browsing. In addition, all of the speakers will sell and sign their own books. The Mosby Heritage Area Association also operates a conference store. Participants: Attendees come from all over the country, and their interests and personal knowledge add to the conference. Serious Civil War buffs as well as first-time attendees and those just beginning their Civil War journey are all welcome. Mouse over the images below for descriptions. Opening a conference field trip at Fredericksburg. Going down to the Rappahannock River on a conference field trip. National Park Service historian Frank O'Reilly chills his audience with details of the Slaughter Pen at Frederickburg. Walking hallowed ground at Second Manassas. Historian Jeff speaks to conference participants. Conference attendees question historian Bob Krick during a break in the action. For more information or reservations, call the Mosby Heritage Area Association at 540-687-6681. Note: The Conference on the Art of Command in the Civil War is always the first full weekend in October.